Last month I spent two weeks in Britain, and purely by chance those two weeks were during the campaign leading up to the UK general election on May 7th. Elections are an incredibly important part of democracy, and I never forget how fortunate I am to live in a country where I get to vote and where my vote can make a difference. Since I became old enough to vote, I have only missed participating in one election that I was eligible to vote in (I had a good excuse – I was in Antarctica). But my trip to the UK gave me the opportunity to see how election campaigns work in another country with a parliamentary system of government – and that being the country whose legislative structure most strongly influenced my own country’s legislative system. There were some major differences that I noticed between campaigning in UK general elections and campaigning in Canadian federal elections. I should note that my UK regional sampling was somewhat restricted (we were only in London, southwestern England, and southeastern Wales), and things may have changed as the election date got closer. But here’s what I noticed while I was there. Very few signs. Canadian elections at all levels of government have numerous candidate and party signs at roadsides, at intersections, on lawns, and on houses. 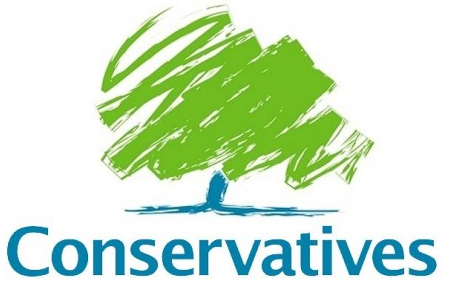 In central Somerset we saw maybe four roadside signs for the incumbent Conservative MP in that riding. And they were very confusing signs [see the picture and caption below]. In the city of Wells there were a couple of small “Vote Tessa” signs, with no party affiliation mentioned; we had to look online to discover that “Tessa” was the incumbent Liberal Democrat MP representing that city. 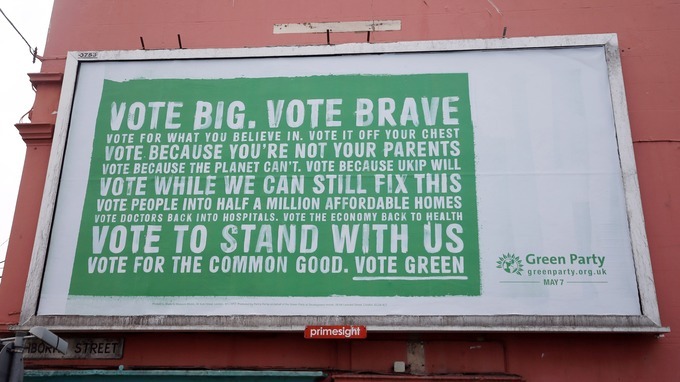 In the neighborhood where we were staying in Bristol, there was one billboard for the Green Party next to a popular walking/cycling path. And….that was it. There’s a saying in Canadian politics that “signs don’t vote”, which is very true – the candidate with the most signs is certainly not always the candidate that wins – but the almost complete absence of signs was very different from the electioneering I’m used to. Where were the candidates? I thought that when visiting towns and cities, and going to events like weekly markets, we would run into at least one candidate shaking hands and kissing babies – but no. We had hoped to attend a debate or rally, but we managed to miss those too. However, it took us a while to discover that what’s called an “all-candidates meeting” in Canada is called a “hustings” in the UK. So we may have missed out on announcements about those events because we didn’t know what to watch for. Intense newspaper coverage. The UK, very much unlike Canada, has many large-circulation national newspapers, and all of them devoted at least a few pages each day to election coverage. I was particularly pleased to see that a significant amount of the discussion was analytical, rather than news stories simply grabbing quotes from press releases or repeating party leaders’ talking points. But the downside to this was….. Intensely biased newspaper coverage. It’s no secret that the political coverage of some UK newspapers is strongly influenced by the paper’s owners, but to see this bias demonstrated every day was quite fascinating. Canadian newspapers may focus their coverage more on some parties than on others, but their news coverage is comparatively neutral in tone, even if the paper eventually runs an editorial endorsing a particular candidate or party. Some of the UK papers not only run daily opinion pieces and editorials attacking or endorsing particular parties, but also spin their news coverage to follow the same slant. At first I found this blatant spinning hilarious, since some of the outrage was so ridiculous that it was entertaining. And to frame a newspaper story as “questions have been raised” or “[candidate/party X] has been criticized” and conveniently omit the fact that the same newspaper “raised” the questions or criticisms in the first place – now that takes some brass. But I had to wonder if the intensely anti-Labour Party slant of some UK newspapers might almost have an opposite effect. The persistent and harshly negative characterizations of Labour Party leader “Red Ed” Miliband surely must make some voters wonder whether anyone could truly be so clueless and so evil. Since some Canadian media outlets have portrayed Nigel Farage and the UK Independence Party (UKIP) as potentially serious forces in this election, I was a little surprised to see that most of the UK papers gave minimal attention to UKIP, and usually neutral or dismissive attention at that. But this may be because of the problems the party has encountered during the campaign, which may have made it even less of a contender than it might once have been. So…….what’s going to happen on election day? Every single person I talked to about the election predicted a hung Parliament, with no one party getting enough members elected to immediately form a government. But while most people thought that either the Conservatives or the Labour Party would get the most votes, no one had any clear predictions as to which other political party or parties the victorious party could join with in order to take power. Pretty much everyone agreed that the Liberal Democrats, who aligned with the Conservatives to form the last government, were “done” and won’t be a factor this time around. There were also suggestions that, after the failure of the Scottish independence referendum last year, the secessionist Scottish National Party will win many seats representing Scotland in Parliament – which, if it happens, would create a very tricky situation for any party in the UK Parliament needing the SNP’s support to form a majority government. I don’t have any predictions on the outcome of the election myself. But it’s been an astounding week for elections so far, and I suspect that the UK election may turn out to be astounding too. I’ll certainly be staying up to watch the election results (thank you, BBC World News!) – and I’m glad I had the opportunity to experience some of the campaign in person. It took me a bit of adjustment when I moved to the States and started reading politically neutral papers (by and large). In Europe you buy a newspaper also for its political bias. It might sound strange and there is indeed a risk of reading biassed reporting, but I tend to believe that it’s next to impossible for a reporter to remain impartial about most of what they are writing about. Now that I have gotten used to the American newspaper style I do find it odd when I visit Europe (although I still love the Guardian and often read it online).